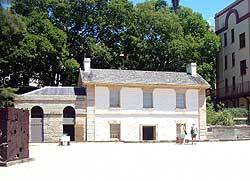 Many people think that Sydney is built around Captain Cook's original landing place at Botany Bay. That is actually the site of some rather uninspiring industrial buildings, and the world famous Sydney Harbour is actually known officially as Port Jackson. It will surprise few who have experienced it to learn that, upon stumbling across the inlet, first Governor Phillip declared that the crew of the Endeavour had ".. found the finest Harbour in the world". It provided for security and the local Dharak Aboriginal people had used the area for many years, knowing it to be rich in food resources. Today, the visitor's demands are also easily met. There can be few harbours in the world where you can take in world renowned sites like the Sydney Harbour Bridge and the Sydney Opera House with just one casual glance. Nature has been kind to the Harbour, and there are a number of attractive headlands scattered along its 20km length. Thankfully, knowing the voracious nature of Sydney's real estate market, the government has created the Sydney Harbour National Park to keep these bushland headlands free from development. If you only see one part of Sydney Harbour during your stay, then make it the area around Circular Quay. This is the heartland of the Harbour and home to the Bridge and Opera House. It can be difficult to know what to look at first; the best view of the Bridge is to be had from one of the cafes outside the Sydney Opera House, whereas, a good vantage point for the Opera House halfway across the Bridge. The beauty of these structures is that their size makes for ample opportunities to view them from different angles: try Milson's Point on Sydney's north shore for an excellent exercise in getting a sense of scale on the Bridge and for a view of the Opera House to the south. One pleasant walk you can take is from Milson's Point, past the Bridge, taking in Luna Park and then heading west over to McMahons Point from where you can get a square on view of the Bridge, with the Opera House nestling beneath its vast arch. Try the Lloyd Rees Lookout at the end of Middle Street and Henry Lawson Park along Henry Lawson Avenue. From here it is not far to the wharf at McMahon's Point, from where you can enjoy a short, leisurely ferry ride back to Circular Quay. Indeed, the ferry provides for an excellent guide to Sydney Harbour. One of the most popular trips is the Circular Quay to Manly journey which takes about half an hour ($AUS 4.60 one way), and takes in the man-made and natural splendour of Sydney Harbour. The joy of this trip is that you get to take in the popular seaside suburb of Manly. With a strip of golden sand, cafes, restaurants and bars it is clear why so many people make their way to this north shore destination in their hundreds every weekend. The beach makes the area ideal for those who just want to kick back and relax, whilst the 10km Manly Scenic Walkway and Manly National Park make it popular with those who prefer to stay active. Oceanworld at Manly is also a firm favourite with visitors, featuring sharks and stingrays which really come to life at feeding time (12.15pm & 2.30pm). Entry is $14.50 for adults ($10 concessions), $7.50 for children and there are some handy family packages available too. You can find Oceanworld at West Esplanade, Manly 2095, Tel: (02) 9949 2644. It's open everyday except Christmas Day, from 10am till 5.30pm. Also visit the Manly Visitors Bureau at Ocean Beach, South Steyne, Tel: (02) 997 1088, Fax: (02) 8966 8123, email: vic@manly.nsw.gov.au, for details and maps. Another good trip to take on Sydney Harbour is to Fort Denison, located on the tiny Pinchgut Island, a former prison which was used to accommodate difficult convicts. It was originally designed during in the nineteenth century to act as a defence against the perceived threat from Russian forces during the 1855-57 Crimean conflict. Sydney Ferries can take you there at weekends - the National Parks and Wildlife Service is currently building a "low-key" café in the former barracks which will give stunning views of Sydney Harbour. It is due to open soon. Finally, Goat Island (02) 9555 9844 is another tiny island stuck out in the middle of Sydney harbour. It has been variously used as a shipbuilders and a quarantine station, and the 3 hour tour is an informative insight into the history of not only this island but the Harbour as a whole. 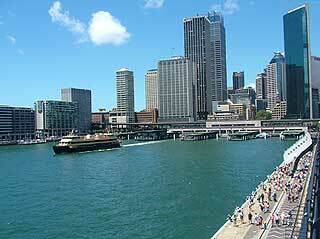 Catch a ferry from the Harbourmaster's Steps at Circular Quay. The tour and transport to and from Goat Island will set you back about $AUS 12.